Mayor Lenny Curry unveils the "What I Can Be From A-Z" initiative on his birthday, July 19. 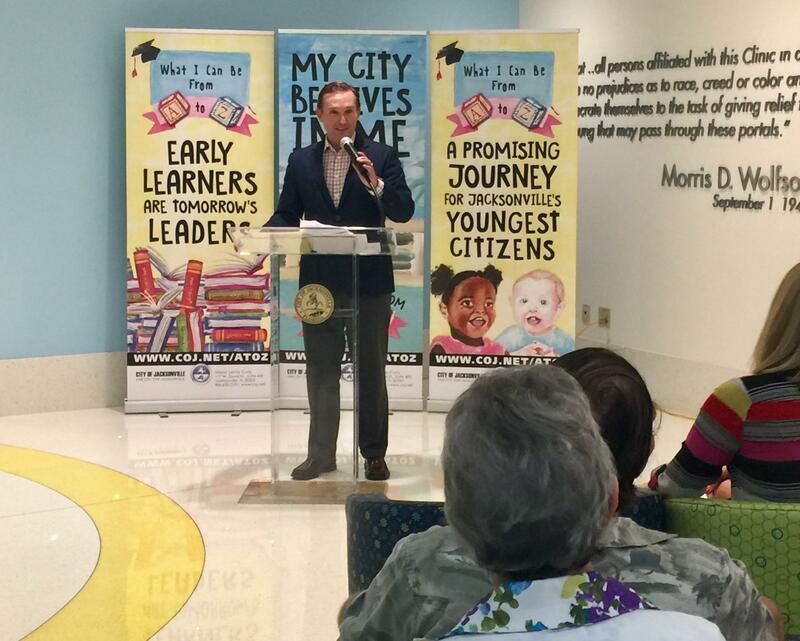 In celebration of his birthday Wednesday, Jacksonville Mayor Lenny Curry announced an initiative to give a book to all babies born in Duval County. At Baptist Hospital downtown, Curry unveiled “What I Can Be From A-Z,” a 40-page book filled with colorful children’s artwork depicting careers and professions that correspond to each letter of the alphabet. The early-learning and school-readiness initiative began out of Duval County Public Schools with support from the Chartrand Family Fund at the Community Foundation for Northeast Florida. Curry says he hopes parents will read the book out loud to their new family member. Copies of the book will be distributed to all mothers who deliver at Baptist, Memorial, UF Health, and St. Vincent’s over the next year. At Curry’s announcement Wednesday, mother Cheyenne Jordan said reading and talking to her premature newborn is playing a huge role in his development. Parents will also be given a poem to read aloud to their newborns, a happy birthday card from the mayor, and a bookmark encouraging them to register their children for a library card. City data show 12,000 to 14,000 babies are born in Jacksonville every year. Nikeya Heath can be reached on Twitter at @Nikereports or at newsteam@wjct.org.